Hyundai has announced details and pricing for the next generation Santa Fe, which goes on sale on October 15. Prices start at £25,495 on-the-road for the entry level Style 2WD model, rising to £34,395 for the top of the range seven-seat Premium SE 4WD. The new Santa Fe offers more interior space than the outgoing model, with 45mm more rear legroom and 11mm more headroom. Luggage space is 534 litres with a further 48 under the boot floor. The car has been tested and tuned to provide comfort on UK road surfaces, with stiffer dampers installed over European models to help cope with the uneven and broken surfaces so common on British roads. Regardless of trim level, all models are powered by a 2.2-litre CRDi diesel engine. CO2 emissions are 155g/km for the two-wheel drive manual, 159g/km for the four-wheel drive manual and 178g/km for the four-wheel drive automatic. Those figures equate to fuel economy of 47.9mpg, 46.3mpg and 41.5mpg, respectively. All variants are offered in both five and seven seat layouts. The style trim is the entry point in the Santa Fe range and offers a good level of standard equipment. 18-inch alloy wheels, parking sensors, air conditioning, Bluetooth with voice recognition and a multi-function wheel are among the items fitted as standard. The mid spec ‘Premium’ trim level starts at £28,995 and adds touchscreen sat-nav, reversing camera, leather upholstery, electric folding door mirrors, dual zone climate control and heated seats, amongst other things. Top level ‘Premium SE’ models get larger wheels, electrically adjustable seats, panoramic sunroof, xenon lights, front parking sensors and keyless entry and start. Premium SE models are priced from £32,695. 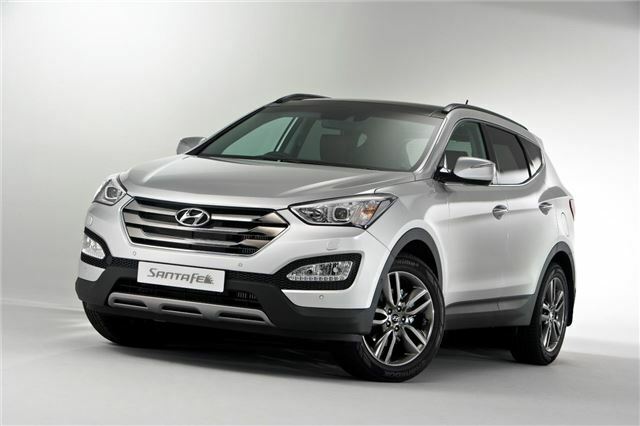 For more information on the current generation Santa Fe, click here.